Once upon a time, a 50’X50′ site for 50 rupees! “The year 1940, after the Ugadi of that year; I was following my grandfather Mahavidwan Ardikoppam Subramanya Sastri who had a string of titles like Mimamsa Bhaskara, Mimamsa Shiromani etc. He was a highly respected person in the Mysore Palace and in Sanskrit circles being the Professor of Mimamsa (a traditional subject) at the Maharaja’s Sanskrit College located at the end of the Hundred feet Road (now Chamaraja double road)…. “The Deputy Commissioner came from the opposite direction on a horseback. “‘Sir, it is Rs 50 for a site of 50x 50 feet’,” the reply came. “Sastriji took out five silver coins of one rupee each and gave him as advance. 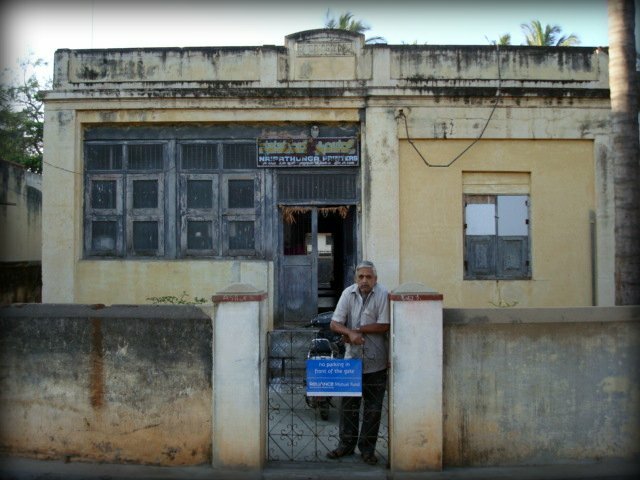 The deal was finalised and my grandfather built a house in third cross in Saraswathipuram and named it ‘Sharada Viharam‘. In picture (above), A.V. Rama Murthy, younger brother of A.V. Narasimha Murthy, poses in front of Sharada Viharam. Below, the Sanskrit nameplate on top of the house. This entry was posted in Mysore-Bangalore, Once upon a time, Rajas & Maharajas and tagged Bharatiya Vidya Bhavan, Chamaraja Double Road, Churumuri, Hundred Feet Road, Maharaja of Mysore, Sans Serif, Saraswathipuram, Star of Mysore, University of Mysore. Bookmark the permalink. Atleast, someone has seen the Savari (Maharaja a.k.a Government) recognise merits in a person – unlike today’s politicians who tend to survive on vote bank politics. Beautiful… uplifting! Thank you for sharing, Prof. Murthy. This was like a fairy tale. So nice hear that 50 Rs was very huge amount, silver coins and maharaja sent gift on gruhapravesham in silver plate with insignia wow something that we cant imagine now. The only way you can see sites costing hundreds of crores is if we start having Mahatma Gandhi starts having 5 zeroes, when Rahul baba/Mayawati/Lallu start doing a Mugabe. Trust me you don’t want to see that. Too good and too hard to believe. Heart warming for sure ! That reminds me. Devaraj Urs was the chief minister and a boy brought up by him was a close friend of our family. One day he came home and said “Appaji is planning to make a new layout called Jayaprakash Narayan Nagar beyond Ragi Gudda and if you pay Rs 6500 he will sanction a 100×100 site on the ring road.” We said “what?! Rs 6500?! who has that kind of money?! And that too for a site in the wilderness beyond Ragi Gudda? !”and shooed him away. Every time i pass through the ring road i look at all the 100×100 sites with a sinking feeling. I remember my father Late R V Ram telling that my Grandfather Late E Ramaswamy Iyer, who was staying in “Ayodhya”, Kantarajaurs road (at present the Hotel Mahesh prasad) an engineer who was with the civil dpt Mysore municipality, who was involved in the construction of tha mysore palace and the new steps to Chamundi betta got the house plots alloted to him right from RK Narayan’s house up to the Kurubar hostel for Rs100, and in turn gave it to his friends for Rs10 per plot, and many of them are yet to pay the amount. Half of the area was acquired for the Lakshmipuram Middle school. We still have one plot at present The Ayodhya next to Mahesh prasad! Now there is an offer for 5 Chrores! The disappointing fact is, in our current society the Mimamsa Bhaskaras/Shiromanis are almost extinct. I know that people are hardly bothered about this.